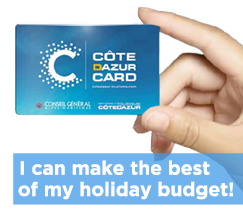 And what about renting a studio or apartment fully equipped for your holidays? Tourist residences located in all resorts of the region offer a range of packages for a successful holiday. A club located on a hill, in an extremely verdant setting, in the heart of a 20 ha pine forest, near Saint-Paul and Vence. Either for one night or for longer stay, LOU CASTELET offer its 52 Studios, two or three room flats, all with air conditioning and sound-proofing, tastefully decorated in the local provençal style.